The Top CES Trends as seen by Tech Geek and GroupM Chairman-DEO Irwin Gotlieb. The annual Consumer Electronics Show tour hosted by GroupM‘s Irwin Gotlieb not only stands out for its longevity but for the media agency chairman-CEO’s innate passion for all things geek. Mr. Gotlieb started coming to CES’s predecessor, Comdex, in 1979, and has watched first-hand as companies like Microsoft and Motorola went from being major players to barely attending the show. “CES is not just about what’s here, but what’s not here,” he said on one of his tours at this year’s CES. 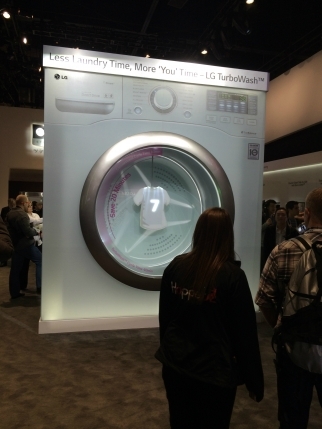 Here’s a look at the five biggest CES trends according to Mr. Gotlieb. Whether or not 4K TV sets, which pack four times the resolution of current HD TVs, will get traction with consumers any time soon was the big question on the show floor, with cost still a big concern this year despite improvements in manufacturing processes. But the picture quality is certainly impressive. Mr. Gotlieb called out LG‘s 77-inch 4K curved OLED TV as the best screen at CES. Organic light-emitting diodes provide far better contrast than usual LED TV technology, Mr. Gotlieb said, but also become “horribly expensive” for large screens. He also pointed to Sharp’s 85-inch LED TV on the 8K standard, which Japanese broadcasters and government want to use for the 2020 Olympics in Tokyo. While many in the TV business were skeptical this week 4K’s near future, Mr. Gotlieb said 4K will move more quickly than HD adoption. Curved TVs were also all over the show this year. While they’re promising for consumers that want big-screen sets in relatively small apartments, curving to offset limited peripheral vision from sitting too close, curved screens can be counterproductive otherwise because of increased reflectiveness and the additional space required, Mr. Gotlieb said. LG’s vision for the connected home will let users receive text alerts about running low on milk or the time left in the washing machine cycle. You might even text the LG Hom-Bot Robot Vacuum when you’re almost home from work so it returns to its base and gets out of your way. Donning his own Google Glass set, Mr. Gotlieb said the question was whether consumers who get used to wearables will miss them when they take the devices off. He said he does miss Google Glass that way. After years of trying to do everything themselves, automakers have finally begun to do deals with outside companies for dashboard apps and navigation, setting off a race between Google and Apple to tie up the big companies and offer consumers new benefits. And General Motors, Honda, Audi,Hyundai, Google and chip maker Nvidia have formed the Open Automotive Alliance, which will work with the National Highway Traffic Safety Administration to create an industry standard for connected cars and in-car mobile app ecosystems. Lexus and Audi used CES to tout their latest advances in self-driving cars, while GM described weather and music apps for its dashboard and plans to begin building 4G LTE hotspots into its vehicles. “The car is likely to become your most powerful mobile device,” Mr. Gotlieb said.